We are currently looking for businesses that are interested in supporting The Goal Setter’s Club local Meetups. Make sure your company, product or service is a good match for our members. Come up with a compelling discount or member perk. Send us your company logo, contact info and a flyer or brochure. We’ll also announce your sponsorship on our Face book page and send out a few Tweets. … and you’re all set. Your business will be listed as a Sponsor for “The Goal Setter’s” Meetup Group. We are Goal Setters! We give each other support and accountability while achieving our goals and dreams? We share some of our favorite resources routines to help us stay on track with our goals. This is a fun-filled gathering of like-minded, goal-setting individuals, all sharing the same passion for excellence and growth. The Goal Setter’s Club: “Home of the Goals Journal” -Please support our sponsor by visiting http://goalsettersclub.com/ and joining their email list. If you have more questions, please email meetup@goalsettersclub.com. 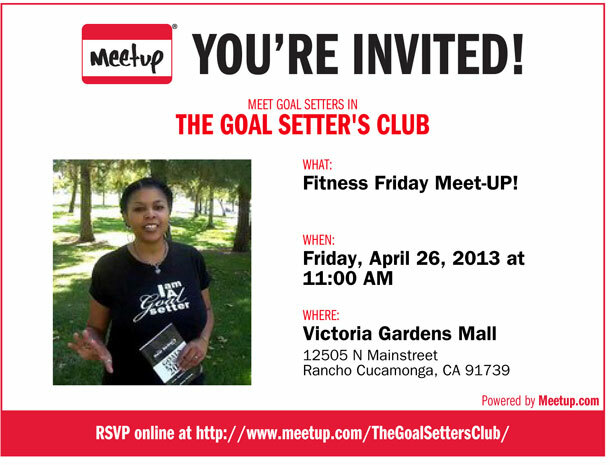 Next Next post: You’re invited to Fitness Friday Meet-UP!